“It was a world event, this performance of Gustav Mahler's Eighth Symphony, so called the Symphony of a Thousand, at the Salzburg Festival of 1960, [indeed] the meaning of this concert in 1960, on the hundredth anniversary of Gustav Mahler's birthday, couldn't be overrated in retrospect. This isn't only because of the aura of a one-of-a-kind concert, but by the content itself - the interpretation of Mahler's Symphony of a Thousand under the direction of Dimitri Mitropoulos. This outstanding work was enhanced with a dramatic impulse maybe never again reached. The young Canadian label, Immortal Performances, puts out this performance again in a quality that clearly surpasses any release you could get before. It's not only because the sound magician, Richard Caniell, didn't much interfere in the original recording…it is the tone of the presentation of this historical recording - so that music lovers can re-experience the proportional dynamics of the concert. In this he succeeded convincingly, one only has to hear the dynamic expansion of the second part of the Veni Creator Spiritus - Imple superna gratia. The care with which the production was created doesn't show only in the sonics, it shows in the well-thought-out composition of the various articles and reaches all the way to the choice of the cover, including the interpretation of the presented motiv used on the cover. 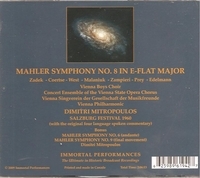 On the double CD you can not only find the recording of Mahler's Eighth, but, as well, the slow movement of the Sixth Symphony directed by Mitropoulis (in a recording with the Cologne Rundfunk Symphony Orchestra of 1959) and the final movement of the Ninth Symphony with the New York Philharmonic Orchestra of January 1960. These two highly interesting and very valuable additions are to be found at the beginning of CD-1 so the two parts of the Mahler's Eighth, the Hymnus, Veni Creator Spiritus and the last scene of Goethe's Faust II, are each put on one CD. Dimitri Mitropoulos, who paved the way for Gustav Mahler's symphonies on the recording, proves in this legendary performance to be an outstanding conductor. The compelling power of this performance is by itself breathtaking….Especially it is astonishing how Mitropoulos binds together this gigantic, colossal masterpiece with well-thought-through and sensitive dramaturgy, and devises highlights and keeps the tension going also in the quiet and silent sections….Besides the visionary compression of this monstrous dimension into a well-displayed dramaturgy, it is foremost a vital rubato that Mitropoulos' interpretation distinguishes. And in the added movements of the Sixth and Ninth Symphony, Mitropoulos follows the energy waves of the music in a highly sensitive way and keeps the tempo flexible within a phrase, so that he can react in the most lively way to the changing tension. So this gives the performance a one-of-a-kind vitality. At the same time it is hard to believe how Mitropoulos achieved such a flexibility to hold together singers and the orchestra!